Kathryn Janeway, daughter of Edward and Gretchen Janeway, was born on May 20, 2335 in Bloomington, Indiana. Kathryn's younger sister, Phoebe Janeway, was born four years later. Kathryn grew up on the great plains surrounding her grandfather's farm in Indiana. When she was six years old, she once watched a bolt of lightning split an oak tree in her grandfather's yard; one she had climbed just a few hours before. Many years later, she recalled that there was no anomaly more frightening than a thunderstorm on the plains, especially at such a young age. Also at the age of six, Kathryn enjoyed an interactive holodeck fairy tale series called The Adventures of Flotter and took ballet lessons, where she learned the dance of "The Dying Swan". She described the dance as being the hit of her "Beginning Ballet" class and recreated the performance in 2373, during Talent Night aboard Voyager. One of her favorite foods, Welsh rarebit, was something she always enjoyed while at her grandfather's. At the age of nine, she and her father hiked the northern rim of the Grand Canyon. She found "the biggest ditch on Earth", as her father used to call it, too dusty and always preferred farm country. When Janeway was twelve years old, she walked home in a thunderstorm over seven kilometers because she lost a tennis match. In 2354, during high school, she would give up playing tennis and not pick it up again until 2373. aneway was also experienced in pool, even though the first time she played with the crew in Tom Paris's holodeck simulation Chez Sandrine, she led everyone to believe that she was a novice. She also enjoyed skiing. Janeway had a special relationship with her father who had raised her to be a doubter and a skeptic and to look at the world with the scientist's eye. When he died by drowning under a polar icecap on Tau Ceti Prime sometime before 2358 she was devastated. She was so grief-stricken she fell into a terrible depression and spent months in bed, sleeping away her days. Her sister eventually forced her into the real world again. Janeway credited the family tale of her ancestor, Shannon O'Donnel, for inspiring her to join Starfleet. The family tale claimed that O'Donnell had been involved as the driving force in ensuring the construction of the Millennium Gate, despite strong local opposition. O'Donnell was also believed to be an early female astronaut, the first of a line of Janeway explorers. Much to Janeway's disappointment, research in 2376 revealed that her involvement in the Millennium Gate project had been far less prominent than everyone thought and that she had been a mere consulting engineer on the project. However, Seven of Nine told her that her inspiration to Janeway should not be diminished by this, as she was still the driving force behind her desire to join Starfleet and become an explorer. During her lifetime, Janeway had studied chromolinguistics, American Sign Language and the gestural idioms of the Leyron. However, she struggled with basic Klingonese. When she was a cadet in Starfleet Academy, she had a close relationship with Boothby, the Chief Custodian of the Starfleet Gardens, who brought fresh roses to her quarters each morning. She also enjoyed spending her time at a little coffee shop on Market Street known as the Night Owl. Her love of coffee and her late nights got her through many of her classes, as she often had to pull all-nighters. She studied under such memorable professors as Patterson, Hendricks, and H'ohk. Janeway was also considered an intelligent and adaptive cadet. Janeway first met Tuvok, who later became one of her closest friends and confidants, in 2356. Janeway was dressed down by Tuvok in front of three Starfleet admirals for failing to observe proper tactical procedures during her first command. Although the incident bruised her "Human ego" at the time, she ultimately realized Tuvok was correct. Ensign Janeway graduated from the Academy and was assigned to Admiral Paris' staff in San Francisco in 2357. At Paris' request, Janeway assisted civilian adviser Kyle Riker uncover the involvement of Vice-Admiral Horace Bonner in the Tholian attack on Starbase 311 in 2353, as well as several attempts on Riker's life. Tired of sitting behind a desk, Admiral Paris made the decision to get back into the game and arranged to be in command of the USS Al-Batani for the year-long Arias expedition. Admiral Paris asked Janeway to join his crew as junior science officer. Six months into the Arias Expedition, Admiral Paris and Janeway were in a shuttlecraft orbiting Utrea II, when they were captured by the Cardassian, Gul Camet. The two officers were rescued by Lieutenant Tighe, whose life was in turn saved by Janeway. 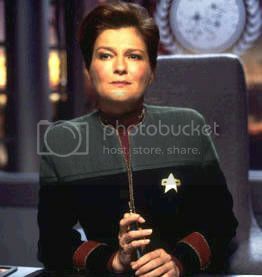 As a result, Paris recommended that Janeway switch from science division to command division. In 2359, Janeway announced her intention to switch to the command division at Starfleet Headquarters. At the arrangement of Admiral Paris, Janeway spent six months on an Earth-bound assignment before being assigned a deep-space mission. While on Earth, she started to become closer to Mark Johnson. By late 2359, Janeway was second officer aboard the USS Mary Kingsley, under the command of Captain Onna Karapleedeez. During their mission surveying the Scorpius Reach in Beta Quadrant, they assisted a civilian research vessel, the Cleopatra's Needle. One of the researchers Janeway worked with was Jean-Luc Picard, who had taken a leave of absence following his loss of the USS Stargazer. While in her first year as a commander aboard the USS Billings, Janeway sent an away team to survey a volcanic moon. Their shuttle was damaged by a magma eruption and three crewmembers were severely injured. The next day she returned to the moon, alone, to complete the survey. She wanted the crew to know that their suffering had not been in vain, despite the possibility that she could have been killed. In 2371, Janeway took command of the USS Voyager in order to locate a missing Maquis vessel, the Val Jean, which had disappeared in the Badlands with her security officer Tuvok who was working as an undercover agent. Given the navigational challenge in this region of space, she proposed to Admiral Patterson to rehabilitate Tom Paris – an excellent pilot and disgraced son of Admiral Owen Paris as well as a former Maquis – for the mission. She visited Paris at the Federation Penal Colony in New Zealand, where he was serving time for his involvement with the Maquis. In exchange for his help in finding the Val Jean, Janeway offered to Paris that she would help him at his next review. Paris was less than enthused about returning to Starfleet after his disgraceful dismissal, but the moment he found out that he would be cut loose, he agreed to join. While chasing the Val Jean in the Badlands, both ships were engulfed by a displacement wave that hurled them seventy thousand light years into the far side of the galaxy deep into the Delta Quadrant. After finding Voyager transferred 70,000 light years across the galaxy, Janeway soon discovered that they had been brought there by a sporocystian lifeform known as the Caretaker. The Caretaker was dying and therefore looking for a suitable mate so that his offspring could continue to care for a species known as the Ocampa. He held a debt to the Ocampa because many years ago he had been responsible for the destruction of their planet's atmosphere, forcing the Ocampa to move below ground in turn prompting the Caretaker to continue providing for them. The Caretaker had pulled both the Val Jean and Voyager into the Delta Quadrant in order to see if anyone in their crews might be a compatible mate. To that end, he abducted the crew of both ships and conducted experiments. These efforts proved unsuccessful, however, as he found himself to be incompatible with any of Voyager's or the Val Jean's crew members. Unfortunately, two of the crew members – B'Elanna Torres from the Maquis and Harry Kim from Starfleet – became ill after the experiments and were sent to the Ocampa homeworld for care and treatment. Given their perilous situation and the missing crew members, Janeway and the captain of the Val Jean, a former Starfleet commander named Chakotay, decided to put aside their differences in order to locate their missing people and find a way home. While searching for answers to their dilemma, they encountered a small Talaxian freighter manned by a man named Neelix who, in exchange for water, agreed to help the crew retrieve the missing shipmates. The Caretaker's condition kept deteriorating and he died before being able to send back Janeway's and Chakotaty's ships to the Alpha Quadrant. Even though Lieutenant Tuvok believed he could activate the system that could send Voyager back, it would have meant leaving the technology in the hands of a hostile native species, the Kazon – which were going to use it to get to the Ocampa. Realizing that this was a sacrifice she was not willing to make, Janeway destroyed the Caretaker's Array by using two tricobalt devices at a yield of twenty thousand teracochranes. Chakotay crashed his ship into a Kazon carrier vessel in order to protect Voyager while it destroyed the Array. This decision left Voyager stranded 70,000 light years in the Delta Quadrant with their only means to get home destroyed. Recognizing their long, daunting journey ahead, both Starfleet and Maquis crews merged and decided to work together when embarking on their seventy-year long journey home. Chakotay became Janeway's first officer and second in command of the ship. The decision to merge the Maquis and Starfleet forces was controversial at first for both sides at first, but the crews would soon learn to work together under the new joint command structure. One of the problems facing Janeway when Voyager first became trapped in the Delta Quadrant was to combine the Maquis and Starfleet crews into one cohesive unit for their journey back home. Their violent hurdle into the Delta Quadrant had left them with empty key positions that urgently needed to be filled such as the position of first officer previously held by Lieutenant Commander Cavit, the helm, chief engineer, a transporter chief, and the entire medical staff including the chief medical officer. Early on in the voyage, there was an incident between B'Elanna Torres, a Maquis, and Joe Carey of Starfleet. Having a fiery temperament, Torres had punched Carey in the nose over a disagreement in engineering. Chakotay, despite being furious about Torres' lack of discipline, still recommended her for the position of chief engineer; a proposal which Janeway initially dismissed, as she saw Torres as an undisciplined troublemaker unfit to hold a command position. Chakotay kept standing up for Torres, however, and after seeing first hand what she was capable of, Janeway agreed to give her the position. While visiting a planet which had been devastated by some type of explosion, Janeway and Tom Paris were transported back in time due to a fracture in subspace. They got caught up between a group of protesters and government officials disagreeing over an energy source and its potential dangers. When the protesters took over a power plant, Janeway came to believe that it would become the source of the explosion, but as the away team from Voyager tried to rescue them by cutting into subspace, she realized that this was the actual cause of the catastrophic events. She sealed the rift, and the timeline changed into one without the explosion having happened. During the first year of the voyage, Janeway made first contact with a number of species, one of which were the Vidiians who were plagued by an incurable phage and as a result harvested the organs of other species for survival. During an away mission, Neelix's lungs were stolen by the Vidiians and The Doctor had to create holographic lungs to keep him alive. After searching for and finding the Vidiians responsible, it turned out that they had already bio transformed Neelix's lungs. However, they possessed the medical knowledge to do an organ transplant and Kes donated one of her lungs to Neelix. Janeway was furious and promised the Vidiians that the next time around, she would not be this generous should they harm any members of her crew again. Janeway also lead the ship into a nebula that was really an organic lifeform. Upon discovering that they had injured the space dwelling being, they immediately worked on a procedure to repair any damage they might have caused to it. Their hopes of returning home were renewed when Voyager came upon a micro-wormhole that ended in the Alpha Quadrant. Janeway made contact with a Romulan ship captained by Telek R'Mor. They successfully transported R'Mor through the wormhole onto Voyager and to the Delta Quadrant, only to find out that that R'Mor was from twenty years in the past. Heartbroken, Janeway asked R'Mor to at least transmit the crews' messages twenty years later to their loved ones. When R'Mor was beamed back to 2351, Tuvok informed the captain that he had in fact died in 2367, and that it was unlikely that he could relay the messages. The same year, they made first contact with the Sikarians, a friendly and hospitable species that possessed some rather groundbreaking technology: they were capable of folding space, thus allowing ships to travel great distances in short amounts of time. However, the Sikarians had their own set of prime rules, one of which prohibited them from sharing key technology with other species. Janeway tried to negotiate with their leader, but he simply refused to share the technology. Humiliated and helpless, Janeway decided to move on, but some crew members, including Seska and B'Elanna, but also Carey and even Tuvok, were not willing to take no for an answer and looked for alternate means to acquire the technology. However, when they tried to use it, they found that it was not compatible with Federation technology. When Janeway found out she was more than upset to see this level of insubordination among her crew. She warned B'Elanna Torres to never cross the line again or else she would no longer be an officer on the ship. Her biggest disappointment was in Tuvok, however, who had led the operation: she felt let down but he explained that according to his logic, he had no choice but to do what the Captain was morally unable to do. Even though she was touched by his loyalty and willingness to sacrifice for her, Janeway told him to never act on his logic again without consulting with her, telling him that she needed to be able to count on him as he was the one she turned to when she needed her moral compass checked. Later that year, she and the rest of the crew found out that Seska, a member of the Maquis crew, was really a Cardassian spy altered to look Bajoran, and that she had been giving Federation technology to the Kazon-Nistrim. Seska berated the captain for having destroyed their last chance to get home and thought her to be a fool for continuing to hold on to what Seska believed to be useless Starfleet principles at the expense of her crew. Janeway tried to explain to her that sharing even minor technology might have dire consequences for the balance of power in that part of space, but Seska, blinded by vindication, could not be convinced. She left Voyager and joined Maje Culluh of the Kazon-Nistrim. Throughout the year, she and Culluh plotted ever newer ways to get to Voyager and capture it. Despite constant attacks by alien races in an unknown and potentially hostile part of space, Janeway also discovered some favorite pastime for the times Voyager was not on constant guard. In order to relax, she participated in a Gothic holodeck program in which she was the governess of a mysterious mansion. The integration of the Maquis crew into the Starfleet crew was not smooth and in the beginning of their journey, both crews faced some challenges. When a few members of the Maquis who were not well versed with Starfleet protocols and procedure exhibited disruptive and even insubordinate behavior, Janeway proposed that instead of punishment, they take on the responsibility of getting those crew members up to speed and instruct them in how to run a Starfleet vessel. For that purpose, Tuvok, who had Academy teaching experience, was put in charge of training crew members who could benefit the most from such training. In 2372, Voyager discovered Amelia Earhart and other Humans in stasis. They had been captured by the Briori to become slaves, but their descendants revolted and overthrew their alien captors. T he Humans on the planet believed that the eight ancestors were dead and honored them in a shrine. Upon revival, the group (Nicknamed the "37's") decided to stay on the planet with their "descendants." Earhart invited Voyager's crew to stay as well, but they decided to continue their journey home. During an attack by space-dwelling lifeforms, Kes began to prematurely enter puberty. That was the first time that Janeway was faced with the possibility that on their long voyage home, crew members would eventually start pairing off and maybe even having children. Although the aliens were driven off and Kes returned to her normal state, Ensign Samantha Wildman informed Janeway that she was in fact pregnant. Voyager came across an anomaly that distorted the structure of the ship, trapping the senior staff in the holodeck. Janeway was injured by the anomaly, but the crew soon realized that it was actually sentient, attempting to communicate. The same year, the ship was attacked by the Botha who caused violent hallucinations in the crew; Janeway hallucinated about her fiance, Mark. However, The Doctor and Kes were able to drive the aliens away and Voyager's crew recovered. Janeway also met up with the Caretaker's mate, Suspiria. Suspiria had taken care of an Ocampa colony. She attacked Janeway and Voyager, whom she blamed for the Caretaker's death. Kes was able to distract Suspiria with her telekinetic powers, allowing Janeway to fire a toxin at Suspira that disabled her. She helped rescue Tuvok and Torres from a Mokra Order prison, after being nursed back to health by Caylem, who believed she was his daughter Ralkana. His wife and daughter had been killed resisting the Mokra Order. As Caylem was dying, Janeway posed as his daughter to assure him that she and his wife were fine. When Tom Paris broke the warp ten barrier that same year, he began exhibiting strange behavior until his DNA completely mutated and transformed him into an amphibian species. In his delirious state, he abducted Janeway, embarked on a warp 10 journey with her which resulted in her DNA mutating as well. When they were discovered by Voyager a short while later, they had mated and produced offspring. After The Doctor was able to restore them back to their Human form, they decided to leave the offspring on the planet they had left them. Janeway joked to Paris that while she did think about having children, she never believed it was going to be with him. She also had her first contact with Q. While exploring a comet, the Voyager crew accidentally released what turned out to be a Q from the core of the comet. After some time, the well-known Q arrived, telling Janeway that the other Q, eventually known as Quinn, tried to kill himself many times, and that this was the reason for his captivity. Quinn asked for asylum and a chance to become Human. He argued that although the existence of a Q is exhilarating and incredible at first, the initial wonder very soon turns to boredom, as there is nothing more to explore, nothing more to reveal about the universe or anything. Because of this unbearable lack of purpose in the Q Continuum, he wished to end his life. Janeway granted his request after a hearing on the matter, where numerous witnesses, including Maury Ginsberg and USS Enterprise's William T. Riker, took part. She urged Quinn to lead a full mortal life. Regardless, he killed himself, receiving a poison from Q, who revealed himself as a sympathizer with the late Q in the end. While attempting to avoid a number of Vidiians' ships, Voyager entered a divergence field and was duplicated in nearly every aspect, including the crew, the two ships connected by a rift in the lower decks that allowed passage between both ships but facing danger as they drew on the same anti-matter supply. When the Vidiians attempted to board one of the ships, both crews were in danger, and one of the Janeways destroyed her Voyager, killing the Vidiians and saving the other Voyager. Janeway also confronted fear incarnate, in the form of The Clown. This occurred when she tried to save a group of aliens who, while in stasis, had been trapped by their malfunctioning neural link. When the consciousness of some of her crew became trapped in the program, The Doctor served as an 'ambassador' to negotiate with the Clown- the 'ruler' of that network, serving as the personification of the aliens' fear that something would go wrong-, the crew eventually tricking him into letting his prisoners out by having Janeway connected to the network without actually entering it, a holographic Janeway sent in to trick the Clown informing him that fear existed to be conquered, and he would now vanish. Janeway later faced a crisis of conscience when a transporter accident fused Neelix and Tuvok into one being, Tuvix. The only way to bring them back to their original form was to eliminate Tuvix, who protested the murder. Janeway had to execute a new, sentient, and innocent life-form so that she could have Tuvok and Neelix brought back to life. The following event is considered one of the most controversial and immoral decisions ever committed by a Starfleet Captain. However, according to current records, despite Federation law, no charges or court-martial was ever placed for the action. Janeway and Chakotay were left behind on a planet due to an incurable disease that the atmosphere of the planet inhibited. They began to show affection for each other, but a possible relationship was put on hold when the crew disobeyed direct orders and contacted Vidiians who knew of a cure. Some time later, Voyager was captured and the crew was stranded on a prehistoric planet. After Paris, along with Lon Suder and The Doctor, regained the ship, the crew was rescued. Seska was killed and Culluh's power base was smashed, allowing Voyager to depart Kazon space with no further contact with them. In 2373, Tuvok suffered a mental breakdown. A mind meld with Janeway took them back to his tour of duty on the USS Excelsior, captained by Hikaru Sulu. T he breakdown was caused by an alien virus that had lain dormant in his mind. Voyager was later attacked by alien ships that attacked in great number. Voyager also came across a planet ruled by the two Ferengi who were trapped by an unstable wormhole. Janeway devised a plan to oust the Ferengi who were exploiting the people. During a visit to a Nechani shrine, Kes was struck down by an energy surge and lapsed into a coma. Janeway underwent a series of rituals to help cure Kes. But in the end, it was Janeway's faith that helped revive Kes. She took Kes through the energy field even though The Doctor told her that it was deadly. It did no harm, and Kes was revived intact. After an encounter with a time ship from the future, Voyager was transported back to the 20th century. They stopped Henry Starling, who had used the time ship for monetary gain, from launching the ship and altering history. The Doctor received his mobile emitter which allows him complete freedom to go anywhere. During that year, Q appeared on the ship and wanted to have a baby with Janeway in order to stop a civil war in the Continuum. He transported her to the Continuum to escape a seemingly female Q that had boarded Voyager. The Human perception of the Q civil war was set in the American Civil War, and Janeway and Q were captured, but the female Q along with the crew of the Voyager managed to enter the Continuum and rescue them. When the Qs engaged in a truce, Voyager was returned to normal space, but not before Q presented his newborn son, whom he instead had with the female Q, to Janeway. After an accident that left Janeway in a coma, an alien energy being tried to convince Janeway that she was dying. It fed off the souls of the dying, trying every trick to get her to cooperate, even appearing to her as her father, but she saw through the ruse and refused. Once the being left, The Doctor was able to revive her. Near of the end of the year, Voyager was captured by the Nyrian who replaced the crew with one of their number using a transporter and imprisoned them on a biosphere ship. Janeway would lead an escape by securing the transporter and beaming the Nyrian leader to a frozen wasteland, forcing them to return Voyager. The encounter with the Krenim began late in 2373 when a Krenim timeship tried to change history to restore the Krenim Imperium. This plunged Janeway and Voyager into a year-long battle. The presence of Voyager had upset the calculations used to restore the Imperium, and therefore Voyager had to be eliminated. Voyager came under a series of attacks by the technologically-advanced Krenim, resulting in the loss of many of the crew and severe damage to the ship. It ended when Janeway suicide-crashed a mortally wounded Voyager alone into the timeship, destroying it and wiping it from existence. This restored the timeline and allowed Voyager to plot a course around Krenim space in the preferred timeline avoiding Krenim territory entirely. Voyager discovered a communications network that allowed them to contact Starfleet. The network was owned by the Hirogen, a hunter race. When Tuvok and Seven of Nine beamed over to examine the network, they were captured by the Hirogen, who planned on killing them and using their bones as trophies. Janeway discovered that the network was being powered by a black hole and by increasing the power relays, she was able to disable the Hirogen ship and rescue the two. Later another Hirogen was encountered during his hunt for Species 8472 which continued on Voyager when the wounded Hirogen was beamed over for medical attention. The final contact that year with the Hirogen took place on Voyager. The Hirogen captured Voyager, and using brainwashing techniques, used the crew as prey in various hunting programs in the holodeck. Janeway played the part of a Klingon warrior killed by the Hirogen as well as the leader of a resistance unit during a World War II holosimulation. After becoming aware of what was happening, the crew was able to retake the ship when Janeway killed the Alpha Hirogen. As the Hirogen left the ship, she gave them holo-technology in hope that they would give up hunting live prey and use the holoprograms instead. Janeway set out to destroy a molecule known as the Omega molecule, the most dangerous and unstable substance known. Janeway succeeded in destroying the molecule but not without opposition from Seven of Nine. Seven, being a former Borg drone, still possessed incredible appreciation and awe of the Omega molecule, which the Borg believed to be perfect. Near the end of the year, Janeway met Arturis who helped them decode a Starfleet message. Decoding the message they found a Federation ship that they believed was sent to take them back to the Alpha Quadrant using slipstream technology, which Arturis offered to help them install. However it was a ruse as the ship was manufactured by Arturis so he could take Voyager and its crew to be assimilated. When his plan didn't work, he settled on Janeway and Seven of Nine being assimilated by the Borg. His people had been fighting the Borg and their only hope was that Species 8472 would defeat the Borg. When Janeway helped the Borg, his people were subsequently assimilated and he wanted revenge. Janeway was able to shut down the force field on his ship and she and Seven were beamed back to Voyager as Arturis' ship arrived in Borg space. In 2375, Janeway and Voyager made contact with a race known as the Malon. While entering a vast void in space with no stars, Janeway rescued a night being who was dying from radiation poisoning. The Malon, who were the garbage men of the quadrant, were dumping radioactive material in the aliens' space. He asked Janeway to close a vortex that the Malon were using to dump the material. Janeway decided to close the vortex, which had to be done inside the void, which would cause her to sacrifice herself. The crew refused to follow her orders and instead persuaded her to close the vortex as Voyager entered it. It caused a shock wave, but Voyager survived and closed the vortex, protecting the space of the night aliens. Janeway discovered that Species 8472 had simulated Starfleet Academy as a training exercise for preparation for an invasion of Earth. This was based on Janeway's actions in their war with the Borg. When Janeway explained that she did not know that the Borg started the war, and that she hoped they could get home faster, the two groups found common ground. She demoted Paris for interfering with a water society. Later, Janeway had a romantic interlude with a Devore commander who, while looking for telepaths to arrest, asked for asylum aboard Voyager. The romance ended when the commander revealed himself as only pretending to defect in order to discover the whereabouts of the telepaths. She saved the ship and Seven from the Think Tank, a group of aliens who solved problems for a fee. They hired the Hazari to attack Voyager and in return for solving Voyager's problem with the Hazari, they wanted Seven of Nine. Janeway discovered another Federation ship lost in the Delta Quadrant, the USS Equinox, captained by Rudolph Ransom. He explained that his ship was attacked by creatures that killed much of his crew. The crew was beamed to Voyager for medical attention and the Voyager crew attempted to repair the Equinox. Janeway discovered that the reason the creatures were attacking the Equinox was that Ransom had been capturing them and using them for fuel for the ship. Janeway confronted Ransom and arrested him and his crew. The EMH for the Equinox, which was beamed aboard Voyager, helped the crew escape back to the Equinox. They disabled Voyager, kidnapped Seven and sped away. In the meantime, the creatures attacked Voyager. Janeway became obsessed with finding Ransom, and resorted to means that would not have been acceptable to Starfleet. She was willing to kill a captured member of the Equinox if he did not tell them the location of the ship, and confined Chakotay to his quarters when he interfered. When Voyager found Equinox, a battle ensued. When the Equinox was damaged by Voyager and attacked by the creatures, Ransom had a change of heart, dropped his shields and surrendered Seven in exchange for his crew beaming aboard Voyager. He himself stayed with his ship as it exploded. Her final words to Ransom was her promise to get his crew home. Tuvok was attacked by cloaked aliens during an away mission in this year. The weapon fire caused brain damage. To cure him The Doctor needed to examine the weapon. With the help of Naroq, a Kesat, Janeway was able to track down the Ba'neth, the race of the aliens and using a photolitic converter was able to uncloak them. When Janeway threatened to expose their location to other races, they handed over the weapon and Tuvok was cured. Janeway encountered the Vaadwaur, a race that had been in stasis for nearly nine hundred years in order to survive the bombardment of their world, which was destroyed by the Turei. After Seven of Nine opened one of the stasis pods without permission, a Vaadwaur named Gedrin was awakened. Janeway offered to help him wake up the rest of his race, in return for allowing Voyager to use its subspace corridors, which would considerably cut the time to return home. Unknown to Janeway, the Vaadwaur were a warrior race that had subjugated many of the races in their sector, including the Turei. They tried to take over Voyager but were unsuccessful. Gedrin refused to betray Janeway and helped Voyager escape. Janeway and Voyager enlisted the help of Tash, who was working on a catapult vessel that could project a ship light years away. This could cut the time of Voyager's trip. However, Seven of Nine tried to sabotage the experiment. Attempting to bite off more than she could chew, she downloaded too much information into her cortical node, resulting in paranoid delusions. She believed that Voyager was part of a Federation invasion force into the Delta Quadrant and that the catapult would bring more ships into the quadrant. She told Chakotay this. At the same time, she told Janeway that the catapult would be used by Chakotay to launch a Maquis attack on the Federation. When Seven used the Delta Flyer to get away from Voyager, Janeway beamed over and was able to convince Seven that she was ill and needed medical attention. Although Voyager was able to send messages to Starfleet through the Hirogen communications network, the network had been destroyed two years earlier and there had been no further contact. Lieutenant Reginald Barclay of Starfleet was able to make contact in that year by opening an artificial wormhole through which communication could occur. Voyager was drawn by a gravimetric wave into the orbit of a planet with a high rate of revolution. Because of a tachyon core breach, a second on Voyager was a day on the planet. While trapped in orbit they observed the evolution of the planet. However, Voyager was unable to break orbit and when the civilization on the planet began space travel, Voyager was threatened and attacked. When one of the astronauts landed on Voyager, Janeway explained the situation, and the pilot returned to his planet. Ships from the planet used a tractor beam to pull Voyager out of its orbit. Janeway also suffered an illusion that she and members of her crew took part in a massacre on the planet Tarakis. The massacre had taken place three hundred year prior, but a synaptic transmitter sent images to anyone who entered the system. This was done as a way of commemorating the people who died. Voyager also encountered a Borg ship that was piloted by children who were separated from the hive due to an accident in space. After Seven of Nine convinced them to release captured crewmembers, Janeway allowed them to be beamed aboard Voyager and join her crew. Later when she returned Icheb, one of the former Borg children, to his parents on the Brunali planet, she found out that the Brunali were sacrificing their children to defeat the Borg. They genetically engineered them to produce a pathogen and when they were assimilated, the pathogen was spread among the Borg, effectively leading to their termination. They saved Icheb, who remained on Voyager. Later that year, after an efficiency report, Janeway became aware that three members of her crew were performing below standard. She decided to take the three on an away mission with her in order to help them improve their efficiency. When the Delta Flyer was attacked by an unknown force, the trio rose to the occasion and saved the ship and Janeway. Janeway also had her last meeting with an elder Kes who, with her telekinetic powers, was attacking Voyager, and by traveling back in time was trying to change the timeline by betraying Voyager to the Vidiians. She blamed Janeway for taking her away from her people, for developing her mental powers before she was ready to use them and destroying her youth. As the Vidiians boarded the ship in the past, Janeway was forced to kill the older Kes with a phaser and Voyager broke free and escaped. Janeway explained to the young Kes in the past what had happened and she made a recording explaining how happy she was and that her stay on Voyager was voluntary. When the older Kes again appeared in the normal timeline, she was convinced by the recording and left Voyager peacefully. She dealt with a mutiny by the Maquis caused by a repressed brainwashing technique implanted into Tuvok by a Bajoran named Teero. A Ferengi. Nunk, a Ferengi, tried to steal some of Seven's nanoprobes. He programmed a fake hologram of Barclay, which arrived on Voyager through the artificial wormhole Barclay had created to communicate with the ship. He was able to steal the codes by using a dabo girl pretending to be a teacher – she was Barclay's girlfriend. The counterfeit Barclay would steer Voyager into a space accident that would destroy Voyager, and at the last minute take Seven and turn her over to the Ferengi. The plot was foiled by Barclay and Starfleet. Janeway again encountered the Hirogen. They had used the holoprogram she had given them after their attempt to take over Voyager, and enhanced it so that the holograms became sentient. The holograms, under Iden, rebelled, killing the Hirogens and other Humans they came in contact with. Janeway joined with the Hirogens and defeated Iden and his murderous desires. But she protected the other holograms who wished to live in peace. Janeway dealt with Paris and Torres' marriage and pregnancy. She encountered Klingons who lived on a generation ship and were looking for the savior of their race and believed Torres was carrying that savior. The ship also became trapped in a void in space in which only those ships willing to plunder other ships for technology could survive. Voyager, by forming an alliance with other ships in the void, was able to escape. The crew was later captured and brainwashed into believing that they were part of a Quarren workforce. Janeway became romantically involved with a Quarren before being rescued. Q enlisted her aid in helping his son, "Junior", who had become a troublesome teenager. Janeway helped straighten the boy out and reconciled him with his father. She also convinced Neelix to stay with a colony of Talaxians they discovered on an asteroid and helped repel a group of miners who were threatening them. Janeway was able to return to Earth with the assistance of Vice Admiral Kathryn Janeway from the early 25th century of an alternate timeline. Admiral Janeway had provided her present-day counterpart with sophisticated anti-Borg technology, including transphasic torpedoes and ablative generator armor technology, in order for her to enter the nebula that had readings suggesting dozens of wormholes and Borg cubes. When Voyager reached the nebula guided by Admiral Janeway, she ordered the crew to enter the transwarp hub, but Captain Janeway was reluctant to forgo the opportunity to damage the Borg's infrastructure considerably. Admiral Janeway is initially reluctant, but after Captain Janeway gets the support of the crew for her plan, the two Janeways team up together to try to do both. While trying to outrun the cascading shock wave reaction caused by the destruction of one hub, a Borg sphere pursued Voyager and attempted to capture it. Upon exiting the transwarp conduit in the Alpha Quadrant less than a light-year from Earth, Admiral Paris ordered all available ships to intercept in response to sensor readings indicating a Borg energy signature. On arrival in the Alpha Quadrant, the Starfleet armada opened fire on the sphere, which had encompassed Voyager, to no avail. However, Voyager destroyed the sphere from inside with a single transphasic torpedo. As this happened, Voyager flew out from the wreckage, much to the surprise and amazement of not only the fleet, but also Admiral Owen Paris, Lieutenant Barclay, and the entire Voyager crew. Voyager was then escorted back home. Janeway was promoted shortly after her return to Earth in 2378 by Admiral Owen Paris. Vice Admiral Janeway was instrumental in defeating a crippling Borg plague that swept Earth upon Voyager's return. In 2379, she ordered Captain Jean-Luc Picard to Romulus to meet the new praetor Shinzon. She was also instrumental in Commander William T. Riker's promotion to Captain and assumption of command of the USS Titan. She was also working to get Project Full Circle used more constructively making it a fleet of ships with slipstream drive to explore the Delta Quadrant with Voyager as the lead ship.